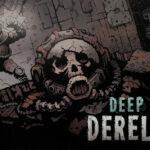 Deep Sky Derelicts is a rogue-like set in the far, dystopian future when only a fraction of humanity living a lush life on planets. Others have to scrape for a living on countless space stations, knowing nothing of natural food and solid ground under their feet. You lead a team of scavengers and explore Derelicts – huge spaceships left drifting around the black hole by mysterious alien race. Essentially, each Derelict is a dungeon. With dangerous monsters, valuable artifacts, NPCs in need of your services, and other attributes of a worthy rogue-like. All locations (and even layout of Derelicts themselves to some extent) are of course rearranged in each playthrough. In addition to standard rogue-like mechanics, there is also an energy limit. Each move on the map, each action in combat, even some special events – everything costs energy. 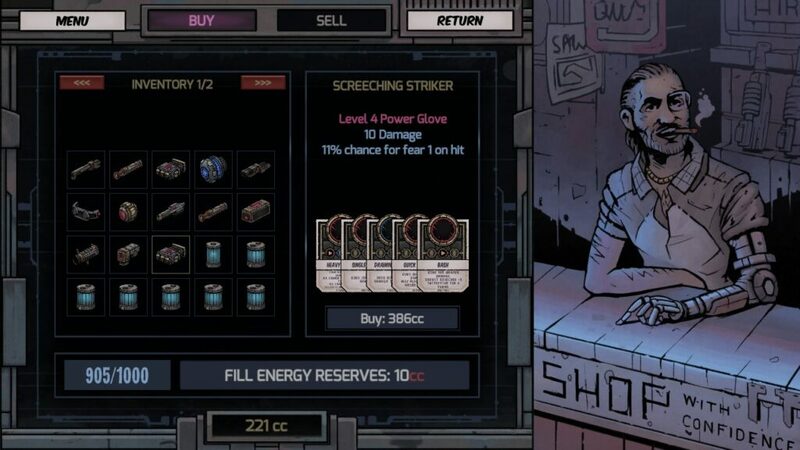 And while there is a bunch of ways to keep your reserve (for example there are energy generators in the store that will make all actions in 3 rooms range around them free) you should always keep an eye on your energy level. Especially if you were ambushed in a room out of generator’s range. 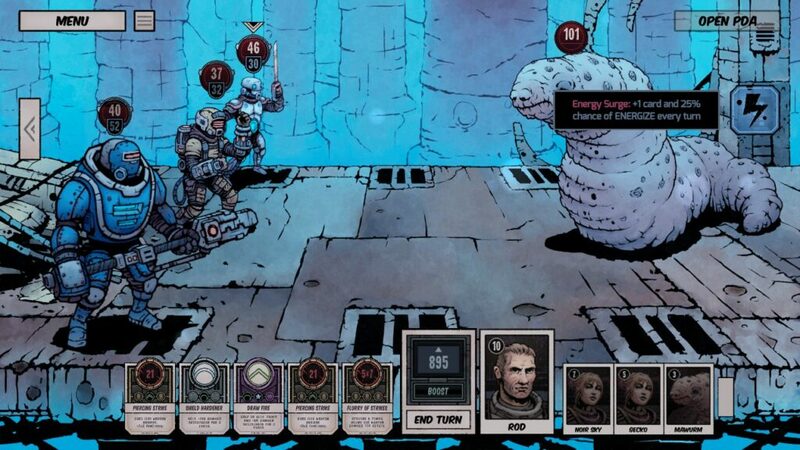 Combat encounters are turn-based, in the manner of jRPG. However, there is another twist – all actions are represented with cards. And the decks, your characters hold, depend on their equipment and skills, you chose during characters’ level-up. Some rooms have special conditions like “toxic atmosphere” or “energy surge” that affect the fight. That’s why you should look not only at weapon’s or item’s stats but also at its “move set”. Having, for example, stunning blow in your arsenal could be more useful, than ordinary spread fire, even if a weapon has higher damage stat. However, you should never rely on one single tactic, as Random is merciless in denying you an optimal card in the critical moment. The progression system is pretty straightforward – your characters gain experience points for defeating enemies and completing quests. And when a character gains enough for level-up, you get 2-3 Skill Points to buy some skills. 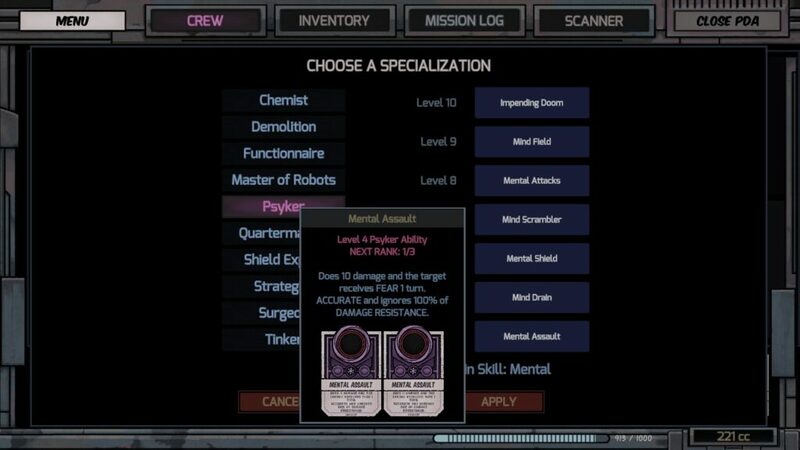 Note, however, that each skill also have 2-3 levels, and each level 2 new skills are unlocked. So you can purchase roughly half of skills in “skill tree” available. Some specialties enhance your class performance, others expand abilities into a diffrent class area of expertise. If you think that 19 skills (10 is level cap and there is just one skill on the first level) are a small number, be mindful that only 12 are connected to character class. 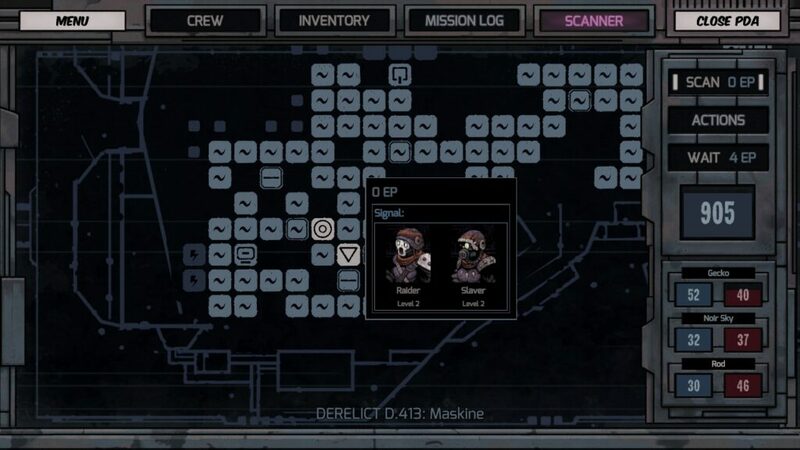 There are six classes in total – Bruiser, Leader, Scrapper, Medic, Tracker, and Technician. Other 7 skills you acquire by choosing one of ten “specialties”, that allow you for an even finer tune of your three characters. 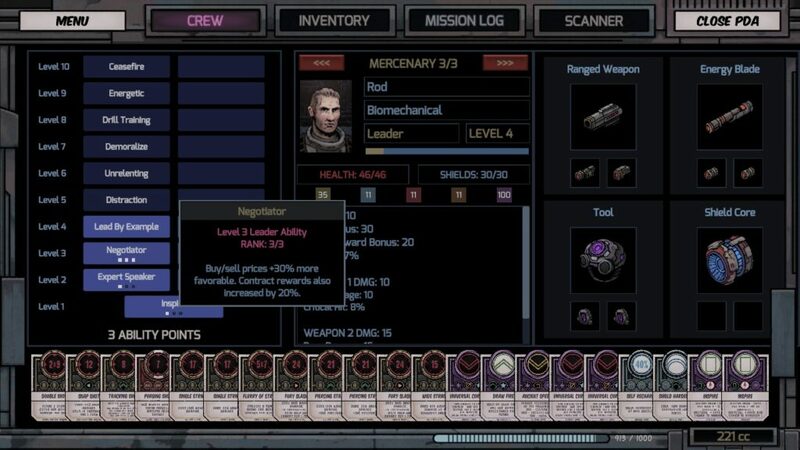 By the way, at the start of the game, you can even choose them a small bonus in damage, initiative or other stat. Visually DSD has a definite comics vibe. And it’s not just art style in the vein of Mike Mignola. When a fight breaks out, each attack and other actions are shown as a comic-book frame, with such messages as “critical hit” put in stripes, like in graphic novels. And during conversations with NPC all phrases, obviously, are put in “speech bubbles”. Conversing with NPC is actually not that uncommon. Some quests are solved through dialogs entirely. And in some you can actually choose how you proceed – use force or persuasion. The success of certain actions (like hacking a console or persuading an NPC) depends on characters’ attributes. Sometimes you can even avoid a fight with certain types of enemies. Upgrades for scanner can seem expensive at first, but later in the game are quite useful. With them, you can identify peaceful and hostile groups, and even detect traps. Also, there are traps that too require specific character skill level to be successfully disarmed. Or you can just use “Scavenger Kit” to get out of the trap safely. Just don’t forget that those kits are also used to clear some blocked passages. Though you can spend some of your energy instead. 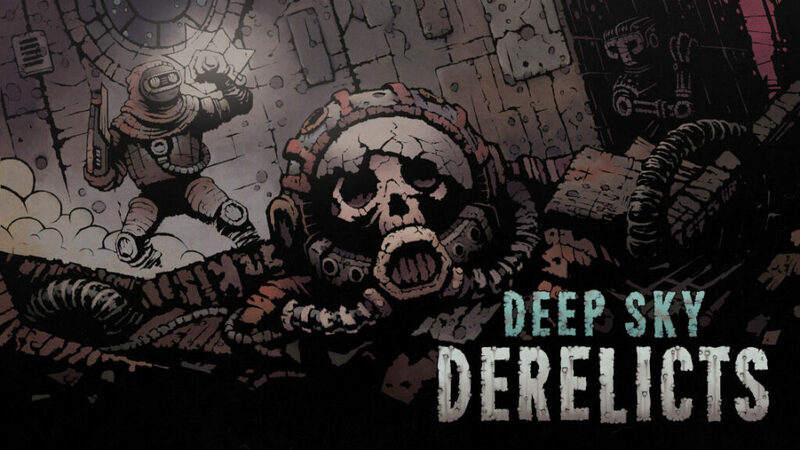 Two main issues in Deep Sky Derelicts as of now are lack of balance and lack of content. Actually, lack of content is not much of an issue in your first couple of playthroughs. Only if you start a game several times, you will stumble upon the same quests and will have to redo “puzzle” you already solved. Lack of balance, obviously, can go unnoticed too. If you pick Bruiser, Scavenger, and Leader (or Technician) from the start, you probably will not have problems with progression. With Medic and Tracker, however, it’s far more likely you will find your team to be overpowered by the enemies. If not because of wrong skill choice, then due to sub-par characteristics of weapons and other items you loot on Derelicts. The shop is actually pretty useful in later stages of the game if you were unlucky with loot drop. However, I would like to note, that developers are still working on the game. And they do add content and fix balance issues (Recycling is not OP anymore, for example). Though it’s a question, what additions will be free and what will be sold in DLC.